PITTSBURGH - April 10, 2018 - PRLog -- . The transparent DF2 galaxy containing globular galaxy clusters was recently reviewed  for dark matter based on the velocity of the clusters inferred from redshift of the calcium triplet (CaT) absorption line, i.e., fast moving clusters suggesting dark matter is present in holding the clusters together, but if slow moving with velocities following Newtonian mechanics, dark matter did not exist. On this basis, DF2 was concluded to not contain dark matter, the consequence of which is significant because cosmology is based on the premise that dark matter permeates all of the Universe. Even MOND, an alternative explanation for dark matter based on gravity, is also refuted by DF2 because like dark matter, gravity throughout the Universe should not depend on galaxy transparency. MOND stands for modified Newtonian dynamics. But what is it about dark matter that has led to the current dilemma in modern cosmology? The DF2 galaxy lacking dark matter is characterized by transparency, but in the Universe, transparency in galaxies is not new. Indeed, transparency in UDG has been known for some time. UDG stands for ultra-diffuse galaxies. Recently, distant UDG have been shown  to have the signature of the absence of dark matter. Unlike the flat rotation curves common to dark matter, the UDG of spiral galaxies have rota­tion curves that decrease with increasing distance from the bulge suggesting the dark matter is negligible. Cosmic dust as the explanation why UDG do not have a dark matter signature is based on the lack of dust between the galaxy and the observer. 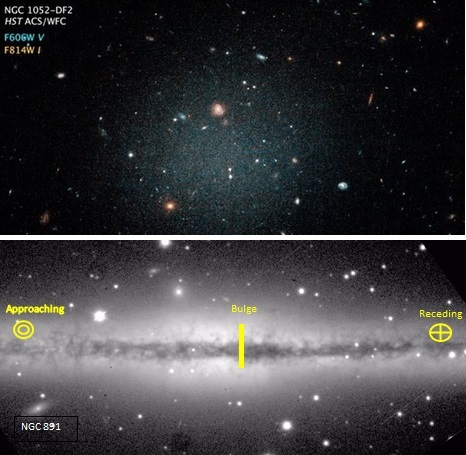 Typical galaxy transparency is depicted in the contrast between the transparent DF2 galaxy (upper) and an edge-on view of the NGC 891 spiral galaxy (lower) shown in the thumbnail. The spiral galaxy shows a thick disk of debris and dust darkened by high opacity, but in the vertical directions is transparent evidenced by bright background stars. The dust darkening is greater from the receding edge to the central bulge than from the approaching edge to the bulge because of the dispersion in the trailing dust. Since dust redshift in the receding region is greater than in the approaching region, the rotational velocity curve is usually plotted from the bulge to the receding edge as the average of both regions. What this means is rotational velocities of NGC 891 inferred from redshifts of galaxy light passing through the dust are far greater than predicted by Newtonian mechanics. Moreover, the redshift of galaxy light passing through the receding region may be considered uniform from the bulge to the receding edge giving a flat rotation velocity curve. Conversely, galaxy dynamics of UDG absent cosmic dust follow Newton's mechanics. Esoteric explanations of dark matter abound the literature only because galaxy velocities based on redshift were, and still are taken as dogma in cosmology, i.e., MOND, Higgs, scale invariance, etc. Perhaps, astronomy should consider the possibility that dark matter is simply the consequence of an incorrect dogma of galaxy velocities questioned by Hubble almost a century ago. P. van Dokkum, et al. "A galaxy lacking dark matter," Nature, 555, 629, 2018. R. Genzel, et al., "Strongly Baryon-Dominated Disk Galaxies at the Peak of Galaxy Formation Ten Billion Years Ago", Nature, 543, 397–401, 2017. X-ray emission by Zero Point Energy or simple QED?